Chicken or egg in connecting Maine to broadband: Access or demand first? 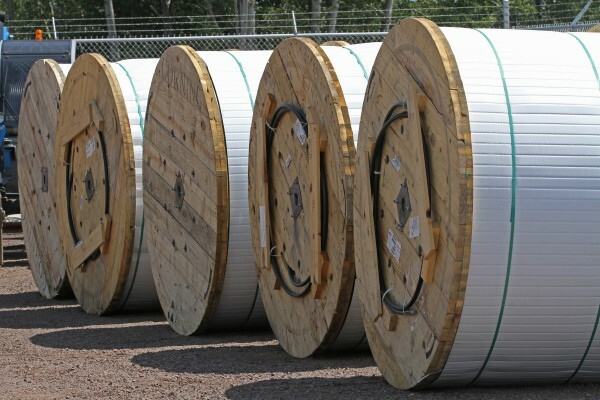 Giant rolls holding fiber optic cable are stored at a Lake Connections construction yard, waiting to be installed as a part of a broadband project in northern Minnesota, July 31, 2012. By the time the communications project is done in 2014 around 2000 miles of fiber optic cable will be strung, connecting customers with broadband internet, video and telephone service. Does access to broadband Internet come first and demand follow? Or does broadband Internet service follow the demand? A new report on Maine’s broadband Internet capacity makes a strong argument that extending the proliferation of broadband Internet access throughout Maine relies a bit on both approaches, but more heavily on the latter. No, not all Maine households can connect to broadband Internet, and Maine ranks 49th in the nation for Internet speeds, according to the report by the Governor’s Broadband Capacity Building Task Force. But those are far from the only issues to consider in weighing how Maine can ensure broadband access at reasonable speeds and cost for all households. One issue is that Maine people and businesses aren’t using the Internet to maximum potential in a way that can expand economic opportunities, improve educational outcomes and lower the cost of government. Among residents, Maine has a disproportionately large share of low-intensity Internet users who seldom rely on the Internet and even see no use for it. If Maine institutions and Maine people relied that much more on the Internet, the report argues, much of the access issue would be resolved by the additional demand. While 97 percent of consumers look online for goods and services, fewer than half of Maine’s small businesses — 41 percent — have a website. Further, 55 percent of Maine small businesses say there’s no need to use the Internet. But 21 percent of economic growth in developed countries between 2004 and 2009 happened because of the Internet, and that figure can only be expected to grow. Without the Internet, Maine’s small businesses are cutting themselves off from growth opportunities. To be sure, the access issue is real: Some 40,000 Maine households don’t have access to a broadband connection, and the ConnectME Authority estimates it would cost $60 million to build the infrastructure to reach those households with broadband Internet. While it won’t solve the entire problem, greater demand could help along the proliferation of access. As it stands now, when broadband Internet becomes available in an area in Maine, about 75 percent of households sign up, compared with a 98 percent “take rate” in South Korea. If Internet service providers can only expect 75 percent interest, it becomes more difficult for them to make the financial case to expand service. Maine government can play a big part in stimulating the demand. Economic development resources can be devoted to training owners of small- and medium-sized businesses on website creation and growing their businesses through the Internet. Government agencies can continue to offer more services online and cut administrative costs as a result. On the health care front, Maine can rely in part on the Internet to switch to a model for long-term care that doesn’t involve sending as many elderly residents to nursing homes. In the process, the state can realize major savings, given that it can cost more than $90,000 annually to house someone in a nursing home, and the state’s Medicaid program often picks up the cost. In-home, Internet-connected technologies that allow elderly residents to communicate with a family member or trained specialist at any time (this technology has been developed by a Damariscotta doctor) can be part of the solution that allows elderly residents to remain safe in their homes. Of course, the technology would have to be coupled with the right community support — such as rides to medical appointments, the grocery store and community activities, and at-home check-ins with nurses and volunteers. Maine’s Medicaid program would need a major restructuring and federal approval to embrace this money-saving change. There is a role the state can play directly in ensuring broadband access for every Maine household. But a culture that demands reasonably priced, reasonably fast broadband Internet access anywhere is likely at this point to have a far greater impact in guaranteeing connectivity.